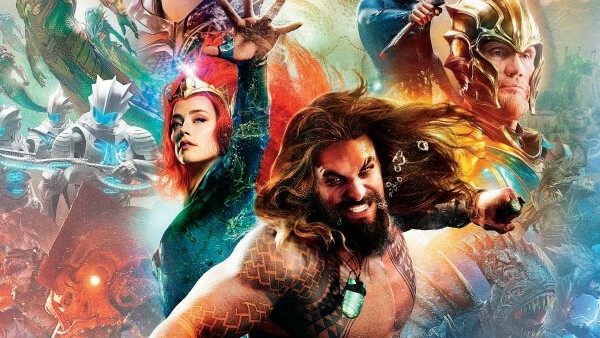 When the new Aquaman poster was released ahead of Warner Bros' showcasing the film at Comic Con this weekend, it's fair to say that there were some interesting takes on it. Apparently, the sight of a superhero who has ALWAYS talked to sea life to help him with his heroism surrounded by sharks, whales, turtles, jellyfish and all manner of other sea creatures was just too much. It might not have been the GREATEST poster of all time, but it at least suggests that James Wan and Warner Bros understand the character and are willing to have some fun with the film. Because another needlessly bleak superhero film for the DCEU would have been like pulling teeth. 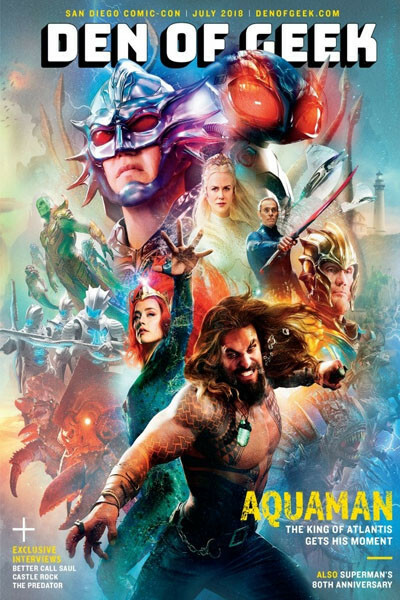 But, that said, the poster has been shown up badly by the cover of Den Of Geek's Comic Con special edition magazine, which the site has just unveiled. It's a far more fitting tribute to what looks to be a supremely odd film, with colourful characters and weirdness all over the place. There's also an almost 1980s fantasy movie poster feel to it too, which REALLY fits the material. And there's a far more specific sense of world-building in there than the version Warner Bros released.